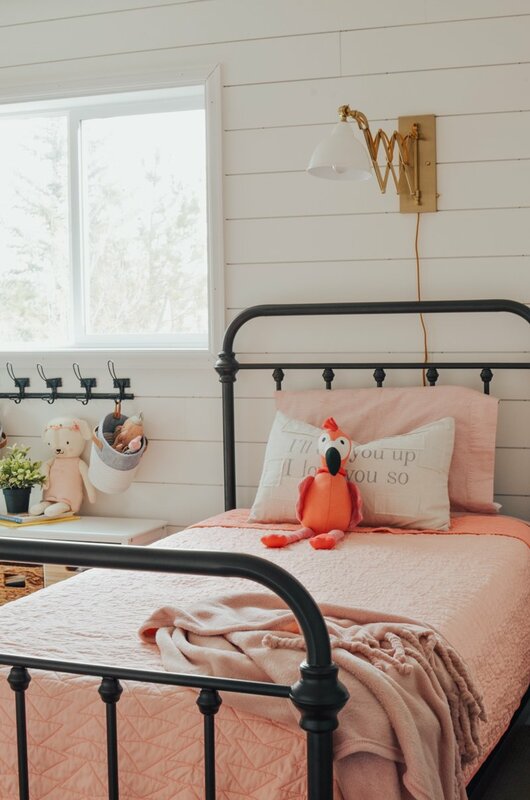 Cottage Style Kids Bedroom Reveal! Quite the change, right?! It really doesn’t even feel like the same room anymore. It went from dark and dingy to bright and fresh, which is exactly what I wanted in here. That window made all the difference and it’s been so much fun to watch this room take on a whole new life. My two older kiddos share this room and they absolutely LOVE it. For the kids’ bedding I picked up these cute triangle stitch quilts from Target and then ordered a pair of super soft fringe throw blankets. I love the pop of color it all adds to the room! I found those school house style wall lamps recently and instantly fell in love. I really like the accordion design, plus they swing back and forth, which makes them easy for the kids to position however they need. 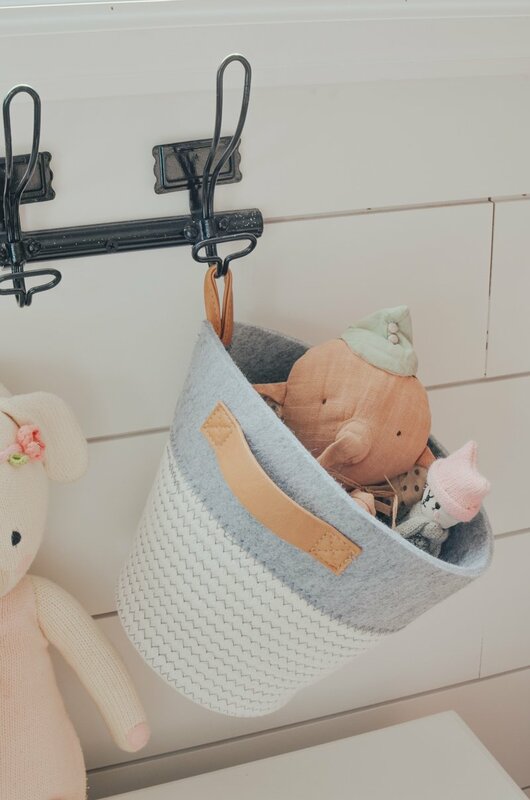 I picked up these cute little hanging fabric bins and they’re the perfect size for small toys and trinkets. Plus I love the little straps to hang from this rack, which is from Hobby Lobby. 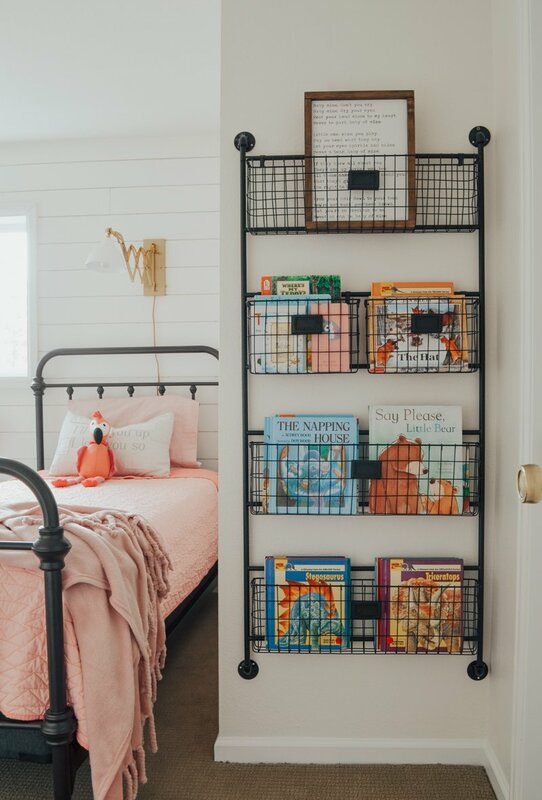 I really love the simple and classic design of these metal beds. They’re exactly what I envisioned for this room and I was so happy to find them for such a great price. The kids have been using them for several months now and they are holding up really well so far. I have this same wall basket down in my office area and I LOVE it. I’ve been anxiously waiting on it to come back in stock so I could snag it for the kids’ room. 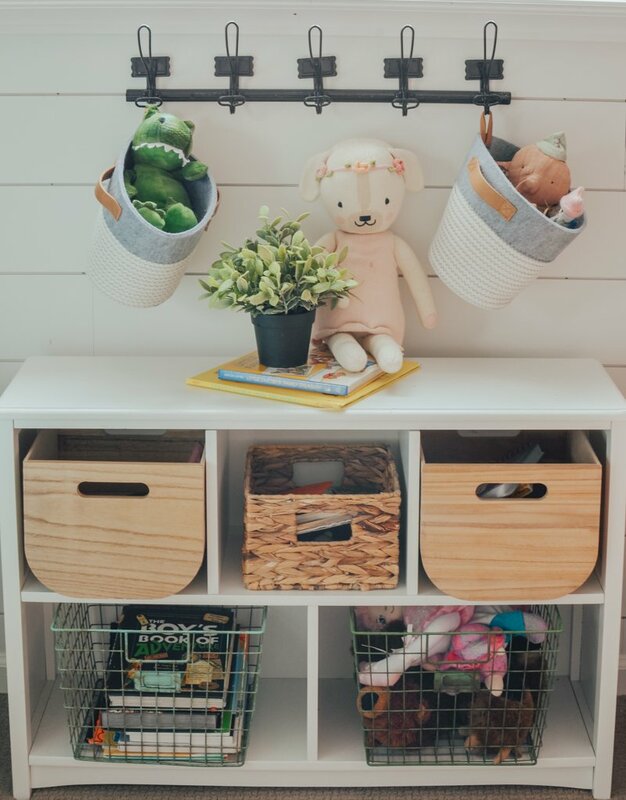 This basket is great because it gives us a ton of storage without taking up much room, which is perfect for a small space. High five if you made it through all of those photos–I know it was a lot! But I couldn’t resist snapping a gazillion pics of this room because I just love it so much. And I still can’t get over how much this space has changed. It doesn’t even look like the same place, right?! 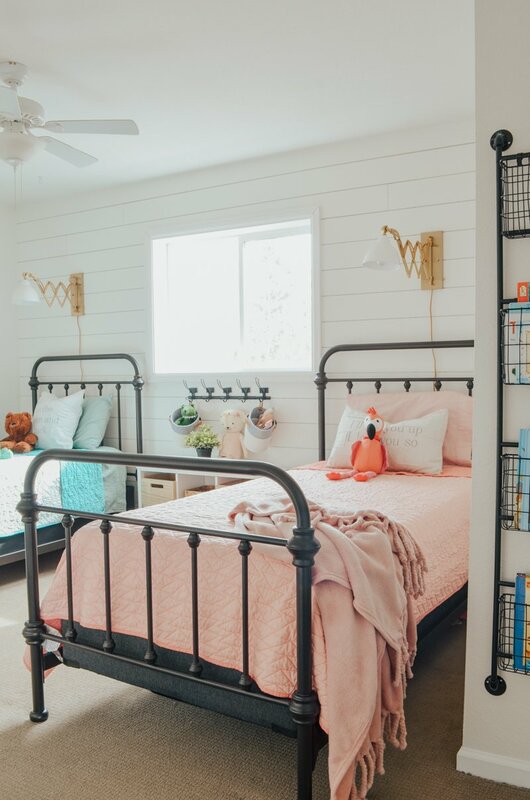 This was such a fun transformation and I am so glad we could finally bring my dream for this room to life. It’s been a very slow process, but worth the wait! room. You have great ideas. The room looks fabulous! What a transformation! Lots of great ideas here! Great job, Sarah – it looks perfect! 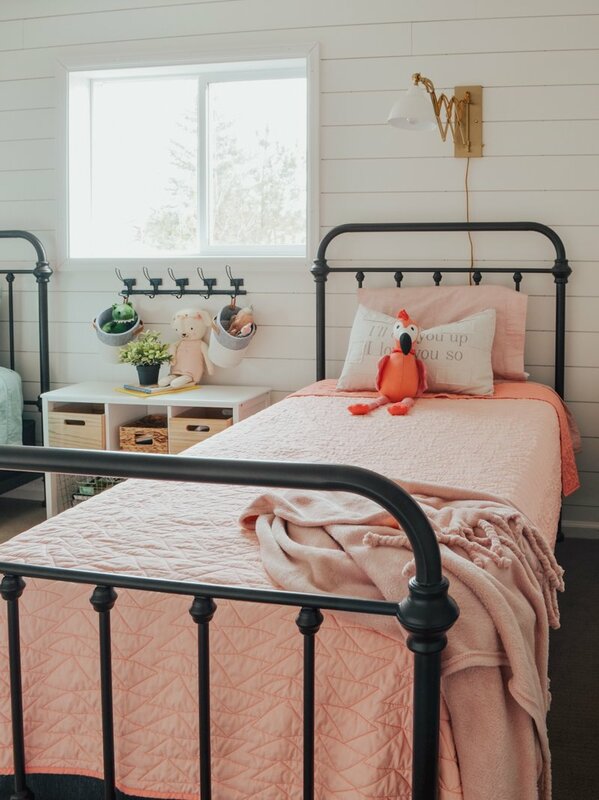 Hi Sarah , the kids room came out soo cute . I love all the storage ideas. 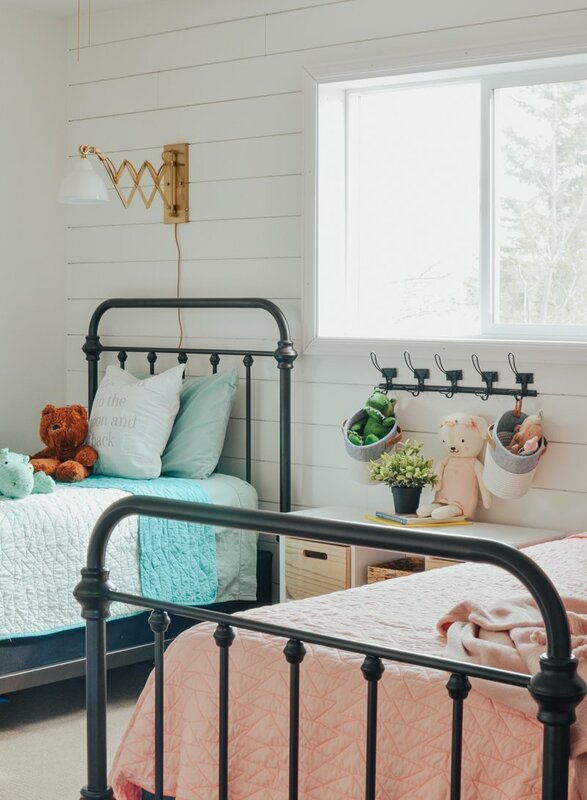 I love the lights over the beds, but have one suggestion for the cord hanging down , cords showing make me crazy don’t know about you ? For a more finished look down the wall I get a cord keeper from Home Depot that sticks to the wall and holds the wire in place it comes in different colors too. they don’t really bother me, but I might look into those in the future! Love the room and thanks for the information as to where these items can be purchased. So many times bloggers don’t list this information. Thanks again, keep up the good work! What a sweet room! I shared a room with two sisters growing up, and have such good memories of that time. Yours will too! It’s a beautiful space. ah that’s so sweet!! I can’t wait for the girls to be together in this room. Just magical! Love it! What are you planning for the window covering? just curious. Good question Katherine! I was planning to do a bamboo shade. That’s actually the last thing I need to do! Love the sweet cottage feel of this room! I wish we had the foresight to add an additional window to our master bedroom, but unfortunately we put a carport on that end of the house which is not only in the way, but even if we could get the window installed it would obstruct the view😐. 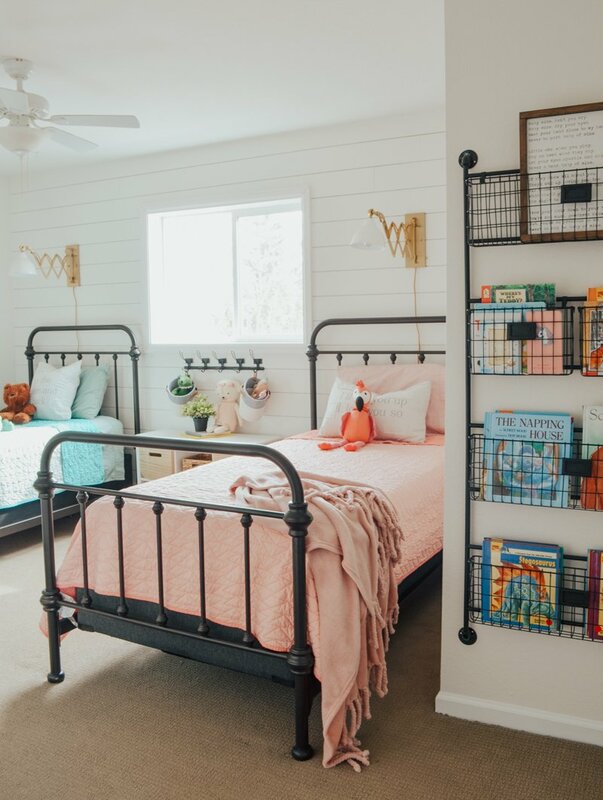 If, at some point, you wanted your girls to share the room and give your son his own room, you wouldn’t have to change a thing! It has such a classic, timeless look! Yes that’s exactly what our plan is, Vicki!! The girls will eventually share this room and we won’t have to really change anything. Hopefully anyway!! Truly the best remake! 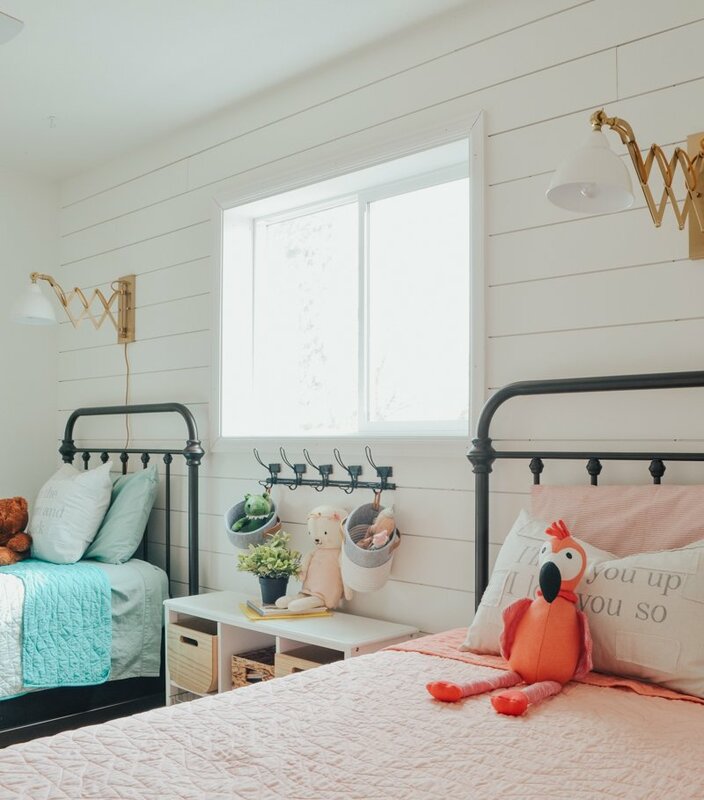 Everything is beautiful and your kidds are lucky to have this room. Everything is amazing and the window addition made the difference. Grade A job. Aw thank you so much Teri, I really appreciate that! Yes I hope it does Becky!! YESSS. I love the transformation of this room!!! It’s crazy how much light plays a huge role in the look of a room. 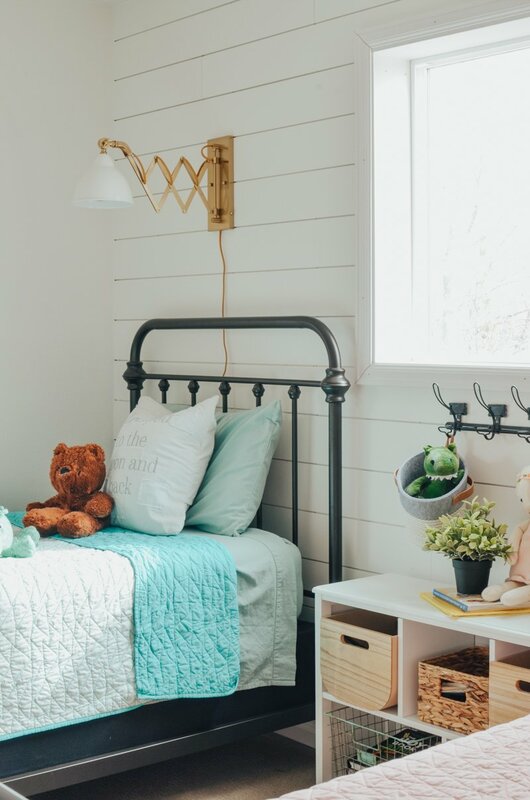 Those bed frames are to die for and I am equally obsessed with the gold accordion lights. I love everything about this room. I’m so glad you finally got it finished. I’m sure your kids love it. Isn’t that true, Alyssa?! Light makes all the difference!! Wouldn’t be so awesome without that new little window. I LOVE it!! Hi Sarah, I love your post and I just ordered you wall storage unit for my craft room. I will fit perfect and it was on sale!!!! I have copied several of your ideas at my house. keep sending us great decorating ideas. I just discovered the 3-5 dollar section of Target. I must have been living in a cave! oh yay! That makes me so happy Sheila. Hope you love the basket as much as I do! 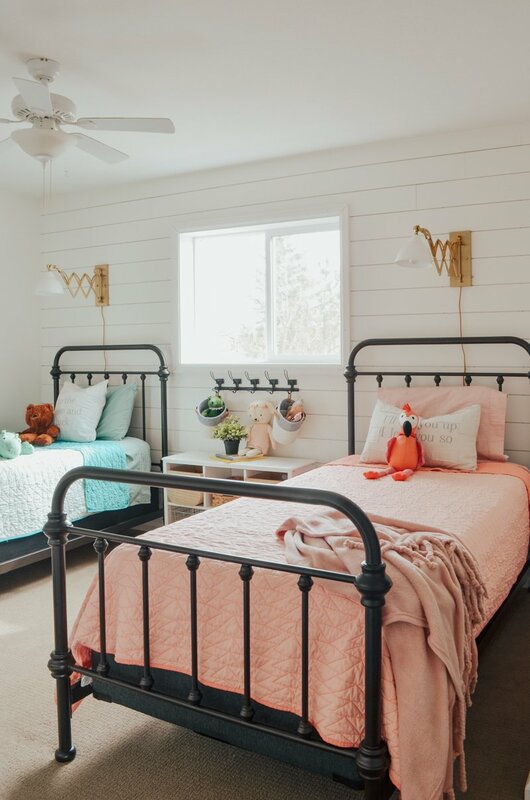 Did you actually shiplap the walls or paint? that’s real shiplap! We actually hired help for that wall. Such a pretty room and I love the colors! You did a great job. Sarah! I’ve been waiting for this post! It’s probably my favorite that you’ve done! 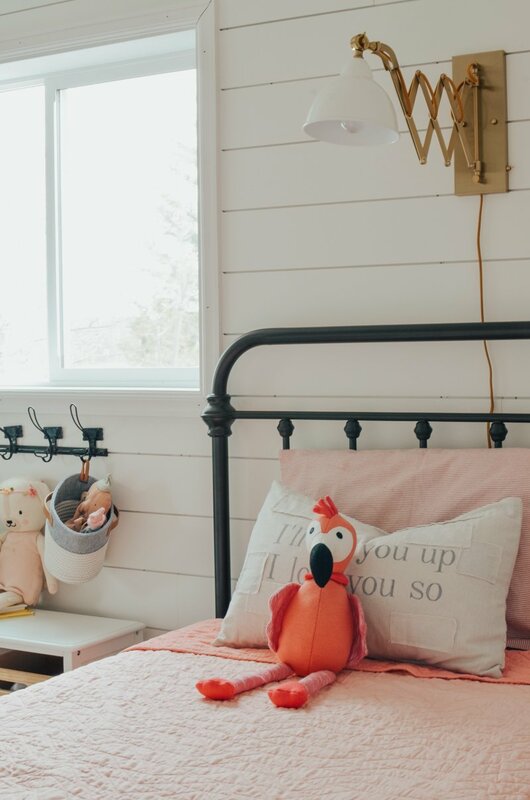 There’s something about decorating kids room that is just so much fun. It all came together so well. I think the lamps were the perfect choice, and using those fabric baskets and hanging from the rack was a brilliant idea. 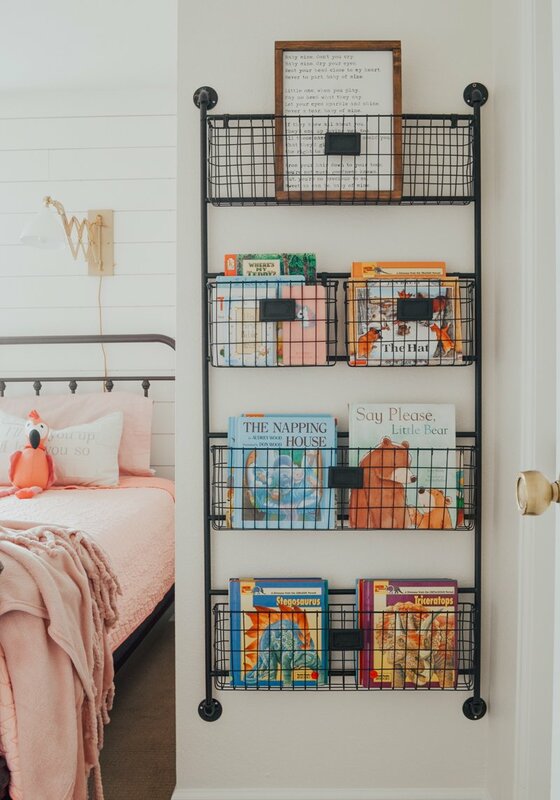 I have a rack in our nursery that I never use, so this might be the perfect idea. Thanks for sharing, you did an amazing job! oh wow thank you so much Kyla!! You are too sweet. I am so happy with how it all came together! Wow, wow, wow 😮 well done Sarah, it looks absolutely gorgeous!! 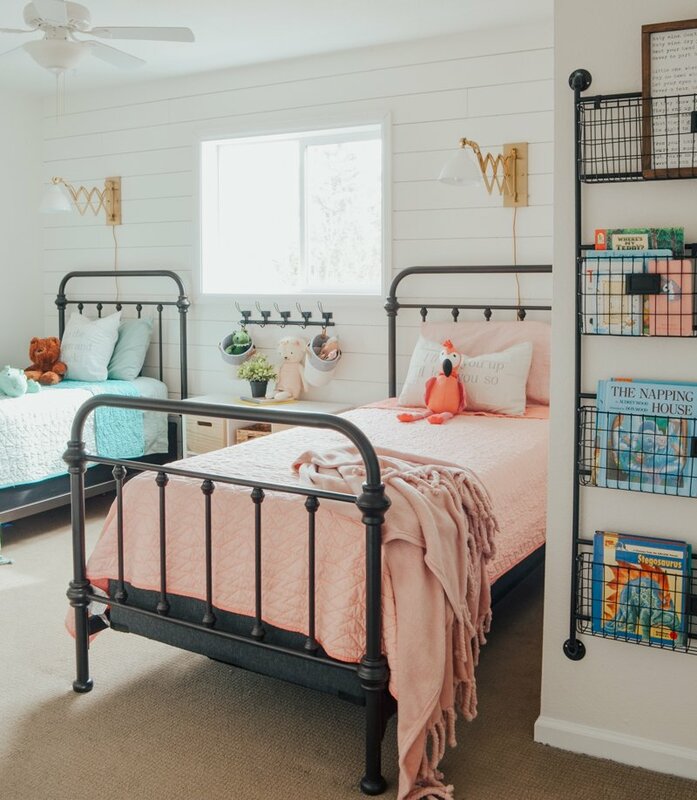 What a awesome space for your kiddos to grow up and share memories together! I was actually just thinking the other day…… has she forgotten to share the finished kids room?!! Because I remember the window reveal and that was such a great addition! Everything I love! Definitely worth the wait! Btw……looking at this shiplap – I want shiplap in my home!!! thank you so much Gayle!! I am just so happy to finally have it done. And yes to shiplap. Give me alllll the shiplap!! Love the room! 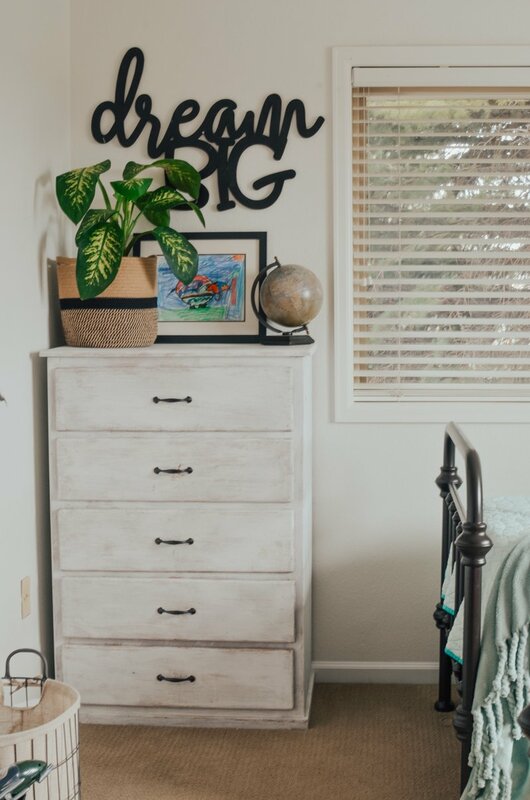 What is the white paint you used? Hi Mary, it’s Alabaster by Sherwin Williams! Looove this room Sarah. It’s turned out so well. Love the colours you’ve used. I bought a bed like this for myself not long ago and I love it. Of course mine is queen size. 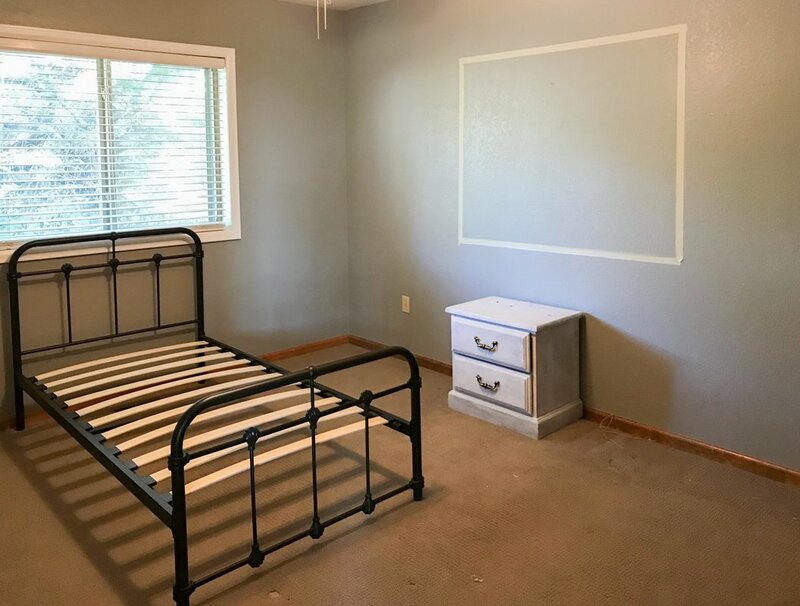 I’m sure your kids love their new room. Oh that’s awesome Sharon! I would love to have a bed like this–just need it in king size! Hi Sarah just want to say that I have only just discovered you about 2 weeks ago and I love your style and ideas. I will be revamping my home over the next 6 months so will be following you carefully. By the way love the coffee ! oh yay!! So glad you found me Sue. Thanks for being here! Gorgeous…and great inspiration! If I were to do a full size bed, do you think one accordion light would still work above the bed or would you put one on each side of the headboard? Great room! It looks like you have Who is the mattresses on a box spring. I’ve never seen a box spring with a nice gray side like that. Where did you find those? Can you put the bed directly on the bed frame without the box spring? I love the room. Where did you find the sheets to match?